1. We will begin by trying the political spectrum quiz below to see what political ideology best suits you. Students can use their cellphone to see where they fit on the political spectrum. 3. As a class, we will mark together questions 1, 3, 4 on Elections chapter questions sheet. Students will write their responses on the board and we will use their responses as the basis of a "lecture" today. 4. We will revisit the concept of "Ideologies" through a drawing on the board that compliments last classes handout. Please see me for the handout since there is no electronic version at the moment. A basic note to help students understand the concepts of "Right Wing" and "Left Wing" below. Left Wing: Promote radical change and larger government, higher taxes. 5. Politicows Overhead: An overhead to help show you about ideologies using "Cows"
Keep the concepts above in mind when we try to determine if something is left wing or right wing. 6.. Slideshow – Canadian Political Parties/Notes. As a class, we will look at the list of current political parties at the Federal and Provincial Level. As a class, we will try to place them on the political spectrum. Please go to Question 4 on your questions sheet. The slideshow will provide some answers for you. Read through election section of unit outline. So that students are cognizant of the steps in an election. Students all need to stand up to read. Once they have read, then can sit down. Keeps things active. -Write on the board, the steps in an election and have students take it down (in ch. Questions if not done yet). Dissolution, Enumeration, Nomination, Campaigning, Balloting, Tabulation. (Students should be able to explain each of these steps and be able to place them in the correct order. 8. Work on election campaign assignment. We will work on this for a couple of days and eventually have an election. 9. Class will watch an example of a political smear campaign in order to understand how politics work. Sometimes in an ideological struggle, some parties will discredit others instead of running a positive campaign where they extol their own virtues. 10. See below for actual campaign ads. Minority ---The party who takes power has less than 51% of the seats in the House of Commons. Majority – A party wins more than 51% of all of the seats in the House of Commons. Coalition – 2 or more parties band together and their seats are enough to run the House of Commons. Can also occur in times of War, when all parties decide to work together and not criticize one-another. 4. Work on Election assignment + Present Election Campaign and conduct class vote. (Campaign, Balloting, Tabulation). Lesson: How to Influence Your Government! 1. How to influence government? -Get class to brainstorm and make a web of ways that they could influence government on an issue. -We will read the section in the textbook on how to influence government. We will also review the answers to the chapter questions. 2. Students will receive a handout of the notes from the chapter. They should be thrilled that they do not have to copy them themselves. This will help them study. While the class reads over the notes, students should draw pictures to go with notes…(especially the ways to influence) – pics on outside in. 4. Review reasons something is an example of civil disobedience. Why was Clayoquot Sound an example? Read the textbook on Clayoquot sound to help students comprehend. 5. Unit test is on Tuesday. Students will have time to review, work on unit vocabulary and work on chapter question completion to assist them in studying for the unit test. Students expressed an interest in clarifying the following: "How a Bill Becomes a Law, Steps in an Election and some of the Unit Vocabulary" We will make time to address any concerns. 6. 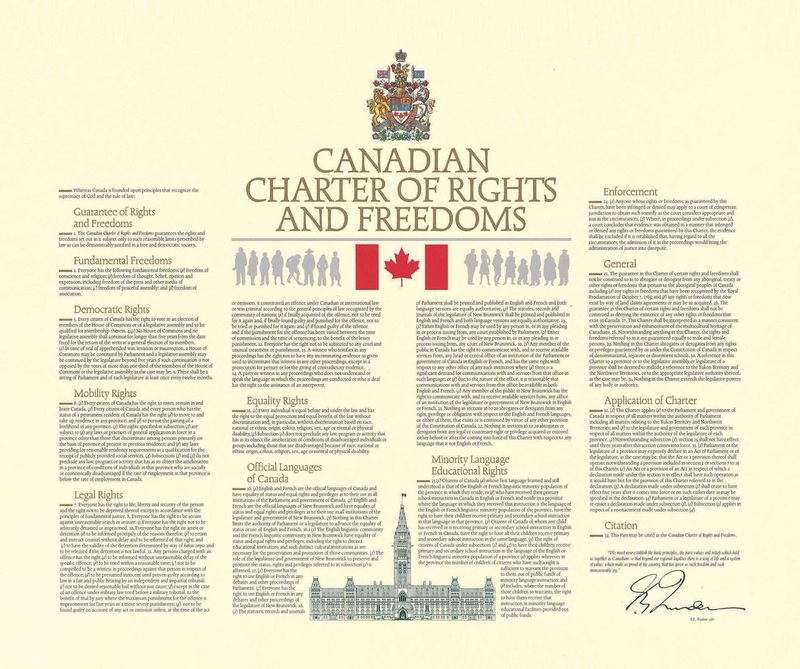 We will learn about the Canadian Charter of Rights and Freedoms (and the Freedoms we have) to concluded our Government unit. See below the videos for a look at the "Charter." For the test, students will need to know the main types of freedoms we have "Fundamental Freedoms, Democratic Rights, Mobility Rights, Legal Rights, Equality Rights, Minority Language Rights.) See slideshow below.